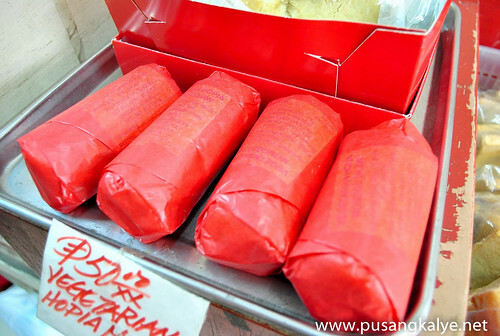 Other than the food map I had with me during our Discover Binondo Staycation,I got a lot of tips from my twitter friends.One suggested I try their hopia at PO CHUAN TIN BAKERY.It's difficult to find hopia in old fashioned red wax paper nowadays but at Po Chuan Tin,they still to it the old fashioned way.When we got to the store,both owners were at the counter and when they noticed I have a dslr and started snapping photos of their products on the shelf,the wife approached me and said they have newly made Tikoy Daliri and she wants us to taste it.She directed her aid to get a few pieces for us to sample. Both couples were very friendly. I thought the woman is the daughter of the man so they started picking on it and joked.Turns out they are husband and wife and they own this small bakery which has been in the same site for many year.The male owner showed me an Inquirer article about their hopia being the 3rd most popular in Binondo.He said they got a review stating their hopia taste "greasy" in contrast to that of Eng Bee Tin.He was quick to point out though that reason for that is because they use corn.That means oil that is good for the heart as he is a heart attack survivor himself. The wife immediately made a follow up saying their hopia is unique because it's the only hopia in town that doesn't become as hard as a rock when refrigerated.He took two pieces of it from their fridge and made us to try em.True enough,they're chilled but still soft.I realized later on that the secret is the thin crust.In other stores,their hopia has a lot of crust and a little filling.It's the other way around at Po Chuan Tin Bakery.The one with the traditional Red Wax paper at least. Back to the oil used,the male owner was very proud to say that he also sells 100% Whole Wheat Bread,the most authentic and healthiest in town he said.It's made of healty ingredients good for diabetics. "Best partnered with our original milk share formula which is good for those who are constipated" he added. Unfortunately,they have no available Whole Wheat Bread that time. Speaking of the tikoy daliri,it came out straight from the kitchen in a few minutes and we sampled it yet again.It's nice,chewy and just the right sweetness for me.I therefore bought 3packs for 35php each.Each pack consists of 3 slices.A little pricey but I was ready to pay for something I could rarely find somewhere else.Also bought the Vegetarian Hopia in Red Wax Paper for 50php each. Don't miss it! PS: Thanks to Richard of http://www.talesfromthetummy.com/ for the tips! 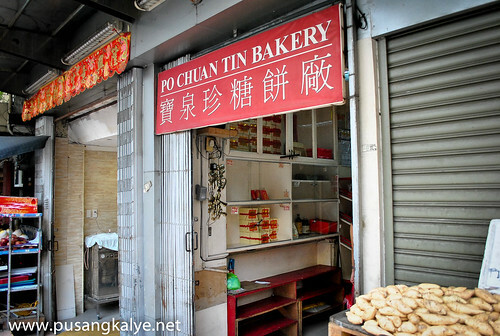 Po Chuan Tin Bakery is located at #827 Salazar Street Binondo Manila. Call em at (02) 243.19.72. I will try to look for this store today :) thanks for the tip! 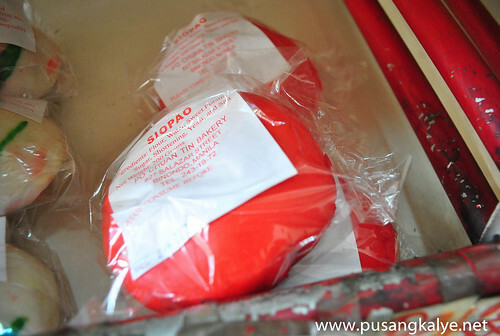 Definitely the best hopia in the Philippines. I never miss a visit when I'm in the area. Eng Bee Ting has become too commercialize and the quality has not been preserved over the years which is sad. It's a great thing that there are still hole in the wall bakeries like Po Chuan Tin that manages to make the hopia like it's been made generations ago.